In a photo shoot for Time, Trump agreed to pose with the most American of all animals - the Bald Eagle. And while in the end he was able to get the perfect picture, the process was a bit more complicated with the bird getting a bit feisty on multiple occasions. 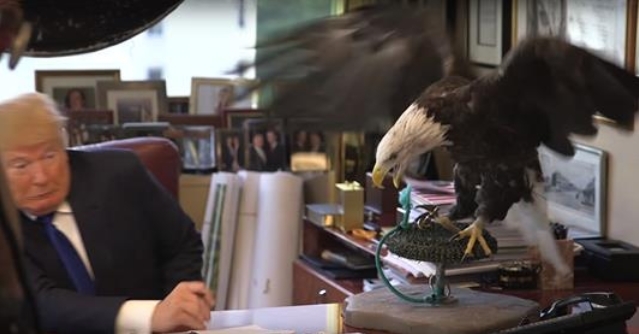 The bird, 27-year-old Uncle Sam, flapped his wings a bit too much while Trump held him on his arm, and then when he sat perched on the billionaire tycoon's desk appeared to try and bite his hand when he went to reach for the phone. He later said of the other subject, Uncle Sam; 'He's very difficult to photograph. f you ask him to look up a little bit, he says no or he just doesn't do it. Responses to "Donald Trump Gets Attacked By Bald Eagle During Magazine Shoot"
It makes me sad to see such a majestic creature being used for such nonsense. What would you expect from our National Bird that is tethered and vulnerable while being near a snake??? too bad the beautiful bird didn't sh't on him- he'd get what he deserves! Even the eagle can't take it anymore. Wake up America, you are now the monster you were born to fight. Do not tell me Time is putting that Nazi Trump on the cover as person of the year. How much did he pay them for that. Bernie Sanders clearly won the poll to be person of the year. Hilter was on the cover of Time once.. I think the bald eagle was after his hair! The Eagle bated because Trump was tensed up and kept putting his hand upwards.It went for his hand because it thought he had food there. Perfectly normal behaviour for a falconers bird.